There are few ailments in veterinary medicine that rival the seriousness and immediacy of canine “bloat,” also known as gastric dilatation-volvulus (GDV). Once the bloat occurs, it is the speed at which treatment is administered that determines whether or not your dog will live or die. Bloat occurs when something goes wrong during digestion of food. Something causes gases to build up in the stomach so fast that the stomach blows up like a balloon, stretching the organ so much that normal circulation of blood to and from the heart is cutoff. The stretching itself and the lack of blood to the stomach’s cells can cause cell death, or necrosis. What makes it even worse and more immediately serious is when the stomach actually “twists and turns” (known as volvulus) at the top near the esophagus and at the bottom of the stomach at the pyloric valve. Picture a tootsie roll candy that’s got a wrapper twisted at both ends keeping the candy lodged inside the paper. That is exactly what happens to the stomach during bloat with volvulus. Gas is trapped and can’t escape as a burp or the other end as “passing gas.” The gas builds and builds as it becomes trapped within the stomach. The stomach grows so large it cuts off circulation, as mentioned above, and irreversible damage is done to the cells. The dog goes into shock and then cardiac arrest. This can happen within several hours after the start of bloat. That is why if you suspect your dog is experiencing this problem, you must RUSH THE DOG IMMEDIATELY to the vet or animal hospital. It is not really known what exactly triggers bloat to occur. Scientists can only make guesses due to the data taken from dogs that have experienced it. When they’ve tried to recreate the bloating conditions in a lab with test dogs, they were always unsuccessful at causing the bloat to occur intentionally. Large meals eaten at one time. They recommend serving your dog two smaller meals a day, rather than just one big one. Rigorous exercise done either right before a meal or right after one. You should wait one hour before feeding after exercise and one hour after eating before you let your dog run around. If only dry food is given, some people moisten it with water if it is a high-end dog food. However, with lesser quality foods, less meat-based dog food, the ones that are mostly grains, it is better to NOT wet the food, since water mixed with grain will start fermentation, a process that has by-products of gas. But if the food is mostly meat, it's OK, and can actually help with digestion. Mix dry food with canned food if possible. Gulping large amounts of water at one time during meals. Keep water within the dog’s reach at all times, except during meals. Be careful of snacks and biscuits that are high in carbohydrates. Grains are carbohydrates. Avoid dog food high in citric acid used as a preservative and also food that is high in fat. IF ANY OF THESE THINGS HAPPEN, CALL YOUR VETERINARIAN OR RUSH YOUR DOG TO THE NEAREST ANIMAL HOSPITAL. It is better to be safe than sorry. As mentioned earlier, there are only a few hours available to handle this problem, so time is everything in a case of bloat. 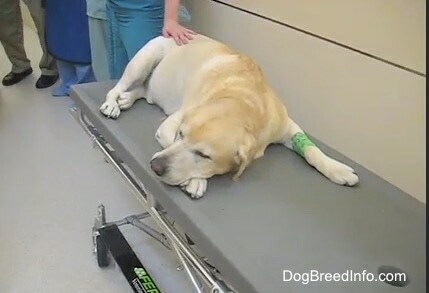 Your vet will put everything else aside to address your dog’s condition. 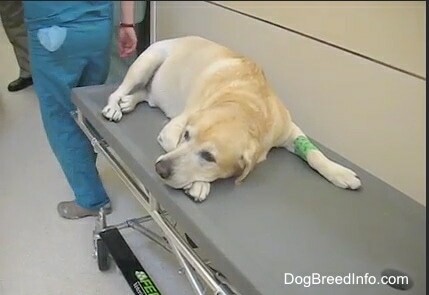 Yellow Lab with bloat after he has been sedated. Before his sedation he was crying in pain. Notice how is stomach is bloated and full-looking.